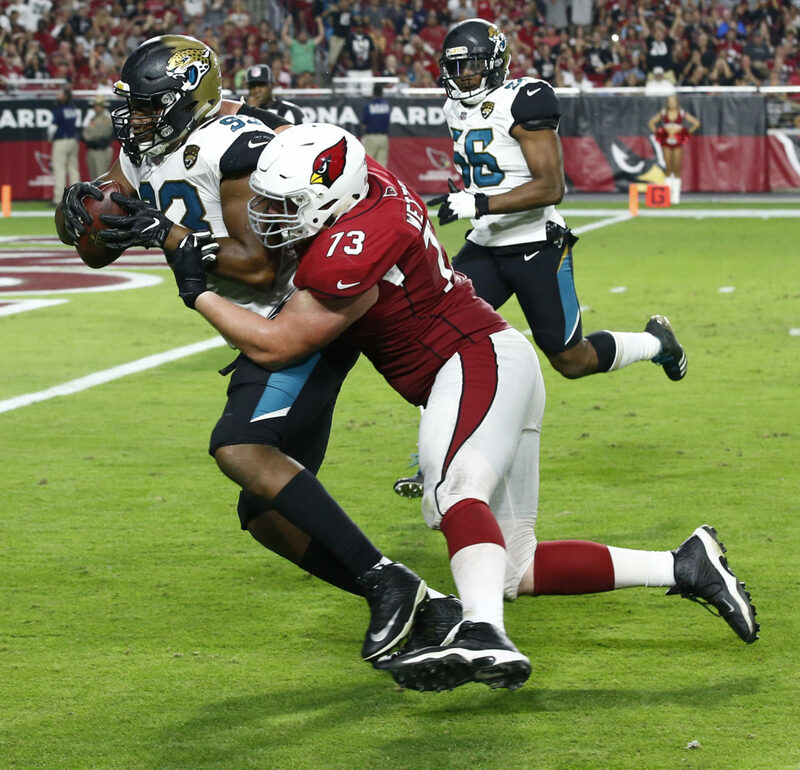 GLENDALE, Ariz. | When Calais Campbell scoped up a fumble and went 10 yards for a touchdown early in the fourth quarter, he thought his homecoming would end exactly the way he hoped. The Jaguars didn’t enjoy their first lead until just two minutes into the fourth quarter when defensive end Yannick Ngakoue came off the edge and sacked former Jaguars quarterback Blaine Gabbert and forced him to fumble on ta third-and-10 at the Arizona 15. Campbell scoped the up the ball and rambled into the end zone for a touchdown. It was the Jaguars’ first sack and takeaway of the game and provided the momentum surge they had been looking for on an otherwise difficult afternoon on both sides of the ball. Campbell finished with three tackles, but the NFL’s sack leader (11.5) failed to add to his total. On a 52-yard touchdown pass to Jaron Brown that put Arizona ahead 24-17, Campbell just missed getting to Gabbert. Gabbert did a good job completing passes to the tight ends in the flat in front of the Jaguars linebackers. Ricky Seals-Jones had four receptions for 72 yards to lead all Arizona receivers. The Jaguars also played the second half without outside linebacker Telvin Smith, who was diagnosed with a concussion at halftime.